I first posted about this book a little over a year ago here, but I finally convinced my Not-So-Young Adult book group at work to read it so that meant I needed to read it again too. I went into this a little worried that I wouldn't love it this time, and I felt a bit of pressure since I told everyone in my book group how fantastic it is. But by the time I finished, I think I felt all of the same feelings as I did the first time. This was surprising since I knew what was going to happen, but I think it's a testament to Jandy Nelson's writing that my emotional response is apparently based less on the surprise and the events of the story, and is more about just how she tells the story and how much I care about the characters she has created. The two main characters, Jude and Noah, are twins and each of them tells half of the story; Noah, the parts that took place when they were 13 and Jude, the parts that took place when they were 16. At the heart of the novel is a tragedy that changes them both, but there's a lot more happening as well. At 13 both twins were applying to get into an arts high school, though Noah was seen as the more promising artist. He also had a budding romance with the boy next door to distract him. Jude was less serious about her art and was more mainstream, hanging out with lots of popular kids from school. Post-tragedy it is Noah who hangs out with the popular kids, conforming as much as possible, while Jude is struggling at the arts school, avoiding boys at all costs, and living her life based on a book of superstitions passed down from her grandmother. I loved the characters so much, and not just Jude and Noah. The artist Guillermo Garcia, who Jude begins taking sculpting lessons from, is tortured and difficult, but ultimately a really wise and wonderful person. Likewise, his young British friend Oscar is troubled and impulsive and makes terrible decisions, but you can't help liking him anyhow. The twins' mother is one of the most human parent characters I've read about in a teen book, and even their father, while not quite as central or well fleshed-out as other characters, was quite sympathetic. Possibly one reason why this book evokes such an emotional response is because of the amount of risks taken or at least considered, and the number of betrayals that occur. A few different characters must make some high-stakes decisions and weigh the choice to take the safe route or do what they really want even though it could be disastrous. Even more painful are the times that people hurt others who they care deeply about. Seriously, nothing in this story is easy and a lot of painful choices are made, but it's all understandable when you get to know the characters. Earlier I mentioned that Jude is sort of obsessed with superstitions and she is forever carrying around strange objects or foisting them onto others because of the magical properties they allegedly hold. It was a little sad that she was so desperate she was grasping at such things, but it was also very fun and I think these rituals gave her a sense of control that she really needed to feel. Noah wasn't superstitious, but what gets him through everything is his "invisible museum," the paintings he create in his head all the time. I loved the descriptions of all his artwork, those he actually made and those that only existed in his head. I wished I could actually see all of his art, which is one of the frustrating things about any book where art is central. Imagining it is good, but I do really want to see what the author is envisioning. Obviously, I have a lot to say about this book, and that is because it's wonderful. Do you like teen books? Do you like good books? Do you like books that make you feel feelings? Then get yourself a copy of this one. Trust me. 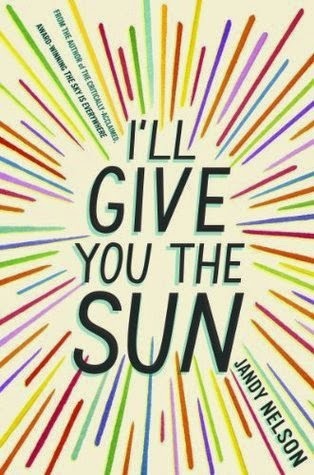 I don't read much YA and I wasn't sure, when I finally picked up this book last year, whether I would like it or not. But I LOVED it. I read the whole thing in two days and then told everyone I know to read it. The writing was superb and so creative. I love how Nelson gave Noah and Jude such wonderfully disparate voices. She's so talented and I'm hoping to read "The Sky is Everywhere" soon. I agree with everything you said, and I'd also like to read The Sky is Everywhere. 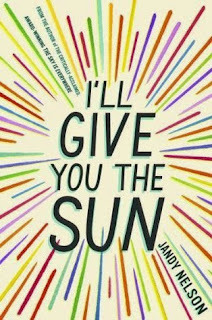 I can't believe I didn't read it after reading I'll Give You the Sun the FIRST time.